The Yantra and the accompanying Tantra, which has been described by me in this post is a special Ganesha Kripa Bhakti Yantra, which is worshipped to gain the blessings of Shri Ganesha. This Yantra is specially meant for the Selfless, Sincere and Pure hearted [Satvik Guni] Ganapati Bhakts who want nothing else in life but the blessings of Shri Ganesha. 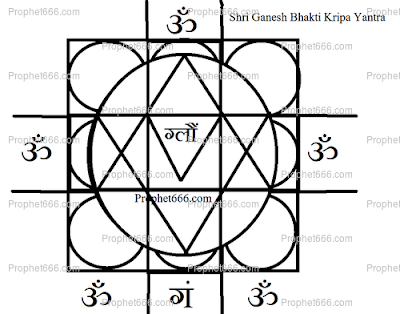 The Yantra should be prepared as shown by me in the image on Sona [Gold] or Tamba [Copper]. The Ganapati Bhakti Sadhana can be commenced on any of the most auspicious days for Ganesha Worship like the days during the period the of festival of Ganesh Chaturthi or Ganesh Jayanti or Sankashti Chaturthi. If unable to commence the Sadhana on any of these days then it can be started on a Wednesday. Each day during the course of the Yantra Prayoga, the Ganesh Bhakti Yantra should be worshipped with flowers, Agarbatti and a Bhog of Jaggery[Gud] and Suhka Khobra [Dried Coconut Pieces]. After the completion of the 121 days Siddha Ganesh Yantra Puja, the preferred Mantra should be chanted 121 times daily. This is a Kalyankari Yantra Sadhana, which imparts knowledge and fulfils all the material and spiritual wants of the faithful Ganapati devotee. Wishing all readers a most auspicious Ganesh Chaturthi 2015, May Shri Ganesha showers his blessings on one and all. in many yantras posted by you iwill like to bring this into you notice that the yantras can be prepared on bhojpatra with this or some other pen or ink type but the same yantra to prepared on white paper then which ink colour should be used,,.. This Ganesh Yantra cannot be prepared on white paper, but if you want to prepare some Yantras on white paper, then unless the color is specified, you can use red ink.